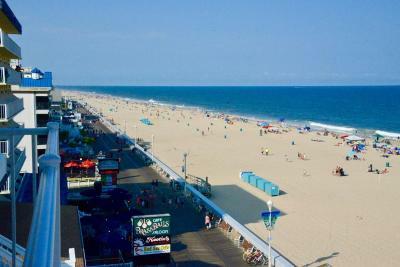 Lock in a great price for Monte Carlo Boardwalk / Oceanfront Ocean City – rated 8.3 by recent guests! The staff (Anna) was very polite and very knowledgeable. The room was clean and comfortable. The location of the hotel was perfectly located. Short walk to the area for the kids but far enough away so you are not bothered by the night time goings on. I was disappointed as it states there was a jacuzzi and I assume with off season they dont run it. We had to check in on 3rd street but stayed down on 11th and the indoor pool was back down on 11th. That was not convenient at all with children and if I had known that, I would have booked else where. When I arrived I was told the hotel was closing due to a mechanical problem. They put us up in a condo on 101 street. This was a ways from Sunfest which added cost for transportation and time. Great location. Very friendly and helpful staff. Overly large balcony’s with a great view of the boardwalk and ocean. The location was perfect and the staff was kind and very helpful. They made you feel like a guest and did whatever they could to accommodate your needs. Beds were comfortable. The convienence of walking to the boardwalk. I'm a disabled person and the staff were very accommodating. Loved that they had a chair lift to get in the pools. Beautiful hotel with friendly and welcoming front desk people who always smile and greet you. 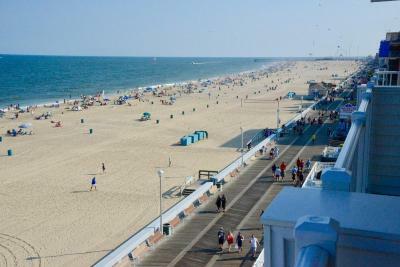 Great beach/boardwalk access, comfy beds and a sparkling rooftop pool. Kudos to the housekeeping staff for keeping the place clean and looking great! 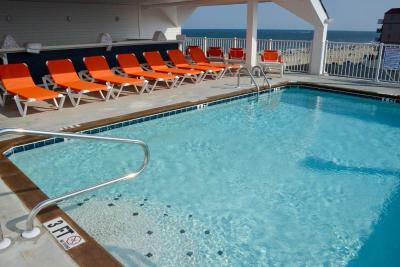 One of our top picks in Ocean City.Offering a seasonal outdoor pool and views of the city, Hotel Monte Carlo Ocean Front is located on the Ocean City Boardwalk. Each room at this hotel is air conditioned and comes with a flat-screen TV with cable channels. You will find a coffee machine in the room. All rooms come with a private bathroom. Extras include free toiletries and a hairdryer. Both free WiFi and free private parking are available at this property. 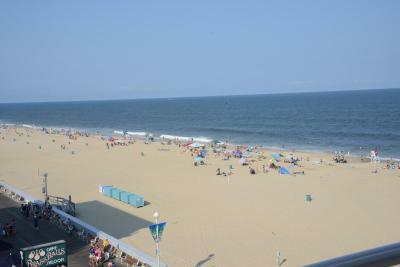 Ocean City Harbor is 1,000 feet from Hotel Monte Carlo Ocean Front, while Jolly Roger at the Pier is 0.9 mi from the property. 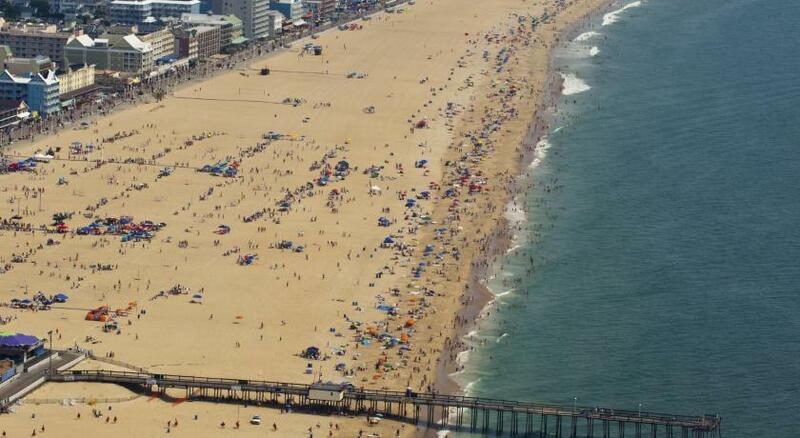 The nearest airport is Salisbury-Ocean City Wicomico Regional Airport, 24 mi from the property. 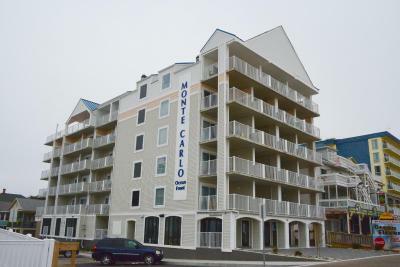 When would you like to stay at Monte Carlo Boardwalk / Oceanfront Ocean City? This room features a side view of the ocean, a balcony, 2 double beds and a kitchenette. This room features a view of the city, a balcony, 2 double beds and a kitchenette. This oceanfront guest room features a king bed and a balcony. This oceanfront guest room features a balcony, 2 double beds, a sofa and a kitchenette. 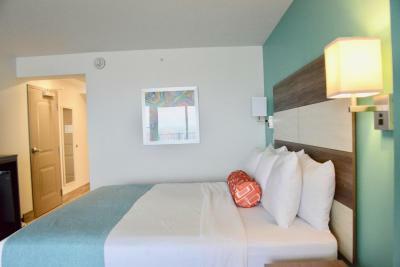 This oceanfront guest room features a balcony, 2 double beds and a kitchenette. This interior room with 2 queen beds feature a sofa and a kitchenette. The room does not have a window. This suite is located in a building that is across the street from the ocean-front building and does not offer views of the ocean. 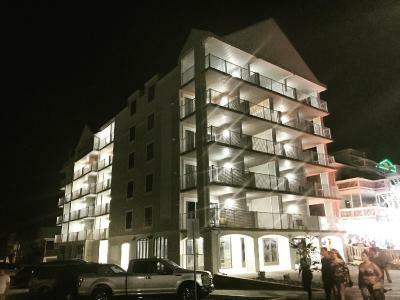 This building is located at a 1-minute walk from the beach and the boardwalk. House Rules Monte Carlo Boardwalk / Oceanfront Ocean City takes special requests – add in the next step! Monte Carlo Boardwalk &#47; Oceanfront Ocean City accepts these cards and reserves the right to temporarily hold an amount prior to arrival. Monte Carlo Boardwalk / Oceanfront Ocean City accepts these cards and reserves the right to temporarily hold an amount prior to arrival. We had to check in one 3rd street and drive to 11th street at the suites but we had trouble finding the building and finding the entrance I think they should have someone at that building to navigate or so one from 3rd st show you the way I did not like that at all. It was dark and we not from there so it was hard to find . Other than that it was a cool room I will recommend to book because it was nice and clean . They could have cleaned a bit better, there were wrappers in the drawers and trash under the bed. We were able to check in a few hours early. Needed multiple parking passes they were very accommodating to that. That I was not advised we would be near the pool not that the jacuzzi was jot working during off season. Housekeeping left a lot to be desired,We had a small child that needed her afternoon nap but most days our room wasn’t cleaned until late afternoon on day it was at 4 pm. Also we had to bring our own toilet tissue. Couldn't stay there. Waiting on refund for prepay of two rooms. Had to leave hotel a day early due to “mechanical” problem that was never explained. Was told we would be put in a different hotel but we would have to move ourselves - no help provided. We just went home a day early! No ventilation in the bathroom. When you would get a shower the whole room felt damp and sticky. Actually seen mold growing on the wall. The shower was big and had dual shower heads. We had an incident in our room, and we needed to be moved immediately. The issue was as a result of insects. The staff was AWESOME. We had an incident in our room, and we needed to be moved immediately. The issue was as a result of an insect, and it was checked, and they moved us to another room asap. They asked if they could clean our clothes and had the room fumigated the next morning without issue. The staff ROCKS! !